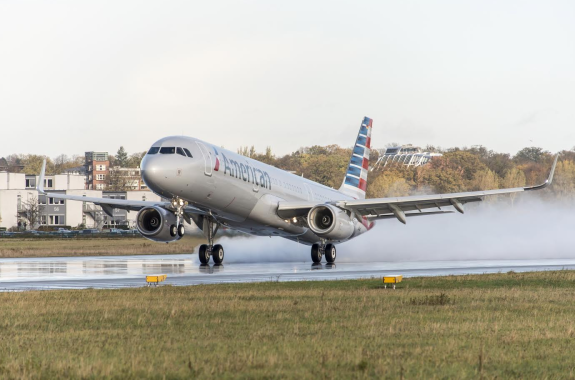 An inaugural flight typically comes with some fanfare, and American Airlines’ first flight of the Airbus A321T from SFO to JFK on March 6 was no exception. I was lucky enough to be on that flight, then returned the next evening on another A321T. This aircraft will replace the old 767s between JFK and both SFO and LAX. But I wondered if when the inaugural fanfare faded, the glow would remain. My work takes me frequently to New York, and I most commonly choose AA based primarily on schedule: a midday flight going east, and an early evening flight going west. But I loved to hate the 767s that serviced this route for as long as I can remember (though I know some appreciated the convenience of the widebody). As it happened, the inaugural flight and my return were the very same flights I typically have taken, making it easy to compare the old and new. I believe American’s A321T is a winner, a classy upgrade in comfort, technology and inflight service. Social proof: I eavesdropped on a conversation of three people in front of me in the taxi stand line at JFK who apparently were on my flight. They couldn’t say enough about the new plane. American is now the only legacy airline to offer a first class cabin between the West Coast and New York. Clearly, the airline is targeting the deep pockets of the entertainment market with L.A. and technology with San Francisco, but it remains to be seen if there’s the market for first class over business. 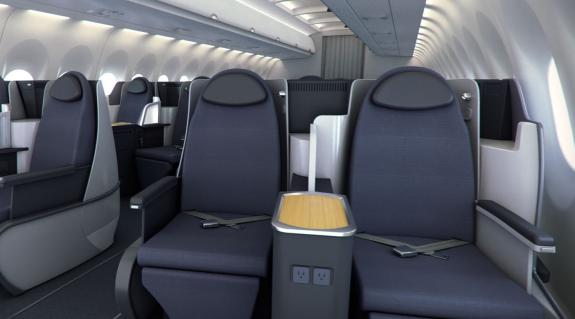 The A321T is outfitted with 10 first class seats, 20 business class, 36 premium economy and 36 economy. 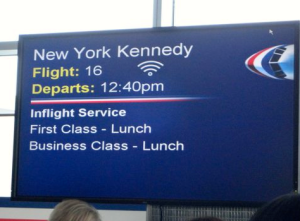 I flew in a first class seat en route to New York and business on the way back. The 1-1 seating in first is incredibly spacious and offers a great deal of privacy, particularly for sleeping, but personally, I did not see much other value (except on a red-eye) to justify a price differential. Both first and business class seats are fully lie-flat. The catering and entertainment systems are virtually the same (exception: espresso/cappuccino available only in first), and both classes gain complimentary access to the Admirals Club. 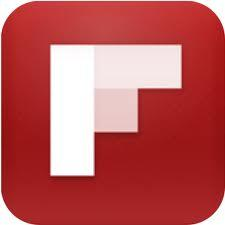 The same flights checked two weeks out show $5902 first class fare as compared to $4,916 for business and $438 coach. (The $986 first class premium over business is not worth it for my budget, but may be for those who weigh it against flying private.) If the market can’t quite support this cabin, the upside for the rest of us may be upgrade availability. There will be no excuse not to fire up the laptop on these flights. Every seat in the airplane is equipped with a universal AC power outlet and USB jack (though the USB was not working on the inaugural flight). In business and first classes, the outlet offers easy access above the left shoulder. In first, the table space between the seat itself and window allows a handy spot to place a laptop out of the way when eating, without cords getting in the way. Coach passengers will find their universal AC outlets and USB jacks on the seatback beneath the video screen. Half of the 72 main cabin seats are premium economy, which American calls Main Cabin Extra. This “class” includes four extra inches of legroom: 35” seat pitch, as compared with 31” in standard economy. By way of comparison, United’s Economy Plus seats on the 757 are 36” over the 31” standard economy. Main Cabin Extra passengers also receive early boarding privileges. A nice feature of the coach seat is that when reclining, the bottom of the seat slides forward, avoiding the laptop crunch when the person in front of you reclines suddenly. You may be sorely tempted not to work (as I was). The in-seat entertainment systems are state-of-the-art and deep in choice, including still-in-theaters selections. I watched a couple of movies fresh off the Oscars, which had aired the week before: 12 Years a Slave and Philomena. The AA PR folks boast that you can press play when you take off, and the plane would have to circle the globe 14 times before you’d have to watch the same thing twice. In coach, there’s complimentary NBC Universal Television, radio and short content, but on-demand packages start at $4, including an exclusive Disney entertainment library that would be useful for families. 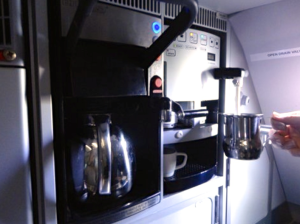 Espresso and cappuccino are made to order in first class. Strangely, business class is excluded from this service. The cappuccino I sipped was Starbucks-worthy, but it seems like a lot of hardware to add onboard for 10 possible customers. The flight attendant who made my cappuccino said she snuck one into business class for Neil Patrick Harris of Doogie Houser, M.D. and How I Met Your Mother fame, but I suppose those of us without celebrity status will not be getting our cappuccinos unless in first. I had never ordered a meal before the flight (available for premium passengers) and very much liked the concept, somehow gaining a small sense of control. Options for business and first class meals are virtually identical. The menu included fare like grilled filet of beef, grilled chicken tapenade and mushroom stroganoff. Ice cream sundaes were served as dessert, with cookies offered later, fresh out of the onboard oven. I ordered gluten-free meals, which were unimaginative. The chicken on the first class flight was so dry and the rice so crusty that the flight attendant offered me a mini bottle of vinaigrette to sauce it up a little, an example of how attentive service can undo the damage of other missteps. With the larger 767 being replaced by a smaller plane, an additional flight will be added to bring the service to five daily each way. Currently, two flights a day are on the A321T (look for the 32B aircraft code when booking online). Beginning April 1, three of the four will be on the A321T, and by June 11 frequencies will be increased to five when the transition will be complete. What will happen to your old friends, the 767s that so earnestly serviced this route for so many years? They will be “retired from service” according to AA. It was time..
Bose QuietComfort 15 Acoustic Noise Canceling headphones are provided for those in premium cabins. The sound quality was excellent, but I thought flight attendants collected them too early. Both times I was in the middle of a movie, which required an awkward hunt for the noise canceling ear buds I’d brought, to finish out the flight. On the way home, flight attendants offered ear buds just after they collected the Bose headsets. Thoughtful, but again, awkward. Overhead space abounds in the A321T, right-sized to today’s carry-on greedy passenger. 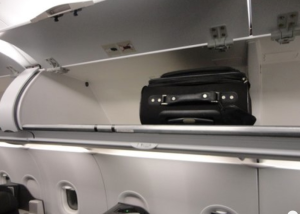 This feature is especially appreciated after becoming grumpily accustomed to the 767’s bins, fully half of which could not accommodate a rollaboard. Overall, I found the A321T to be a lovely ride, beautifully upgraded to meet the needs of today’s passengers—both premium and otherwise. The fact that I was a guest of American did not color my view, and fellow passengers with whom I chatted were as enthusiastic as I. A couple of limited-time offers sweeten the pot for Bay Area travelers wanting to hop on board the A321T: Inflight entertainment in coach is complimentary through March 31, plus first and business class passengers earn double elite qualifying AAdvantage points through May 31 (must register). If your travels take you to and from New York, the A321T is a top-notch way to go. 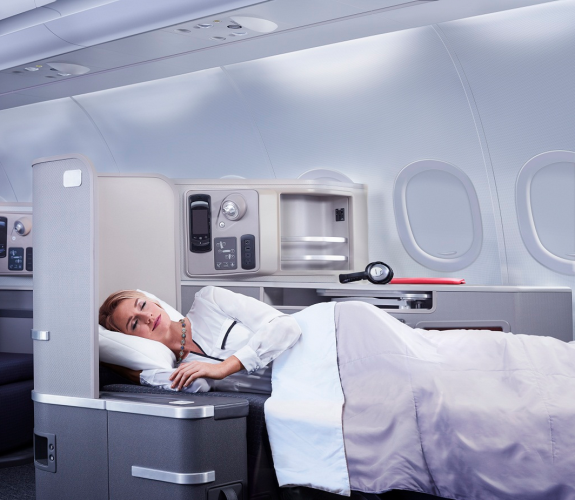 What’s your preferred airline, airplane and class of service for transcontinental flights? Will you give the new American A321T a try? Please leave your comments below!